FAQ: How to visit an aircraft or instrument operator? How to visit an aircraft or instrument operator? 1. On the top main menu, click on Activities, and then in the drop-down menu, click on Education & Training; alternatively click here. 2. 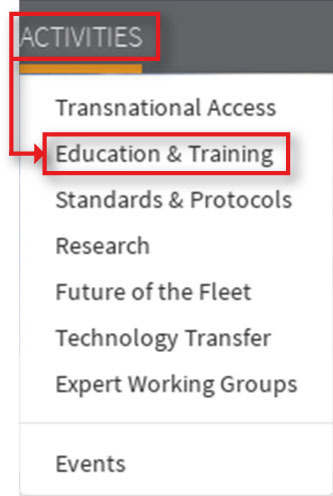 Scroll down to the bottom section of the Education & Training page and click on the tab ET-VO and click on the icon Apply. 3. Fill in all the required fields (*) in the form. To provide as much information as possible, it is advised to fill in the optional fields. Click on Submit to launch the submission process. 4. Make sure to fill in and upload the "travel & subsistence" cost estimate, in the form, indicating the estimated costs of your visit.